George H. Durand was born in Cobleskill, New York, on February 21, 1833. He spent most of his childhood days working for his father on the farm and his evenings diligently studying. Upon completion of his courses in classical studies at Wesleyan Seminary, he moved to Michigan. By the age of 18, Durand was teaching school in Oxford, Michigan, and he began the study of law. Upon his entrance to the Bar, he opened his own practice in Flint. For nine years, he served as director of public schools in Flint and later served as Alderman of that area. In 1873, he was elected Mayor of Flint and was re-elected the subsequent year. However, prior to the expiration of his term, he was elected as a Representative to the State Legislature. 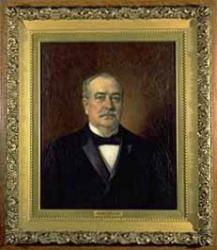 While serving in that capacity, Durand was the chairman for the Commerce Committee. In 1875, he was admitted to practice in the United States Supreme Court. His service on the Michigan Supreme Court began upon the retirement of Justice Allen B. Morse in 1892. George H. Durand died on June 8, 1903.